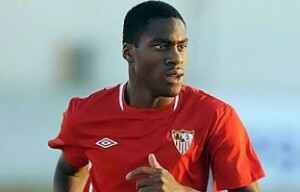 Reports are out claiming that Arsenal are watching Sevilla midfielder Geoffrey Kondogbia. The Sun reported that the £17million-rated France Under-20 midfielder is also on Chelsea, Manchester City and Real Madrid’s radar. Wenger said: “I don’t really want to talk about Kondogbia too much because everyone’s after him at the moment. Wenger is desperate for a quality holding midfielder.